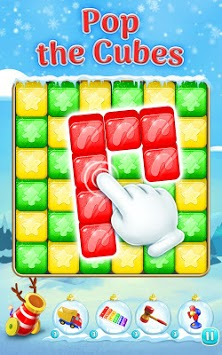 Feel the Christmas magic in the air in the new tap 2 game! Blast cubes & enjoy! 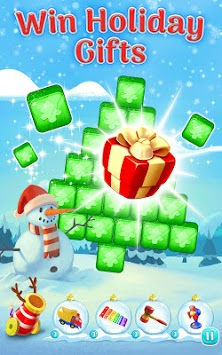 Get into the holiday spirit - it’s time to blast all the colorful bricks! This incredible tap 2 game is the best puzzle to play on Christmas Eve with your family and friends. Match, pop, and explode 2 or more dazzling cubes of the same color to clear levels and solve the super challenging quests. Thinking what to ask from Santa Claus this year? We recommend the ultimate Christmas app - Christmas Blast! It’s the most enjoyable and fun cubes game, and it’s completely FREE! Complete the missions set at the beginning of each level and collect different items to win. You have a limited amount of moves, so you better think it through and plan your ultimate path wisely. This amazing new holiday game will bring you gifts and prizes that will look pale next to Santa Claus’! Join the fun and solve intriguing puzzles in this brand-new Blast Tap 2 game! If you love exciting brain teasers, you are definitely going to enjoy this free and amazing tapping puzzles while staying in on Christmas day and looking at the snow. Match and pop 2 or more adjacent blocks of the same color to create a cube crash. Reach the target and complete the enjoyable blasting challenges. Blast and explode all the cool tiles to clear the board and get super awesome boosters and rewards in return! Playing free tapping games is the best way to pass the time! Join the colorful blast game adventure and crush all the cubes! Make special combinations to unlock power-ups! 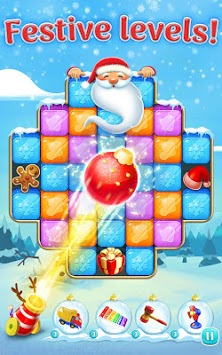 - Colorful Christmas graphics and amazing blast effects. - Use boosters and pop the blocks away and win amazing gifts and prizes! - Thousands of exciting, new levels. - The fewer moves you use to pass a level, the higher score you'll get. Match the cubes and clear the boards to win amazing rewards. Download this incredible game today and join the Christmas-y merry fun!